On Sept. 6th and 7th, 2016 OMAFRA, along with Ontario Pork and Swine Innovation Porc, will host a Group Sow Housing Seminar. Two different seminars will present group sow housing options with practical solutions to the challenges of different systems, along with potential opportunities associated with group housing. Both days will feature a discussion panel and exhibitor space. The day 1 evening program is designed for producers who already have group housing systems in place. We will provide ample opportunities for discussions amongst producers, and will focus not only on how to handle some of the challenges producers encounter, but on the potential opportunities that are available to producers within these systems. The day 2 program is designed for producers who are looking at group sow housing options. This full day program will provide practical information from a wide variety of speakers. Should you renovate or build new? What will you do with your sows during a renovation? What are producers doing across Canada? How can you capture added potential through Nutrition? What technologies are coming down the line? Pre-registration is required by Aug 26th, 2016. Are you ready to think outside the stall? On Sept 6 and 7, 2016 OMAFRA along with Swine Innovation Porc, Prairie Swine Centre and Ontario Pork are hosting a Group Sow Housing Seminar in Stratford, Ontario. Two different seminars will present group sow housing options that follow the 2014 Code of Practice for the Care and Handling of Pigs, along with practical solutions to the challenges of different systems, and potential opportunities related to group housing. Day 1 is designed for producers who already have a group housing system in place, and Day 2 is open to anyone interested in learning more about group sow housing. John Van Engelen, Hog-Tied Farms Ltd.
9:40 am The Barn: New Building or Rennovation? 10:30 am What to do with Sows during Renovation (depop vs. rollover)? Dr. Julie Ménard, F. Ménard Inc.
4:00 pm 2014 Workshop Producer Update – Where they Are Now? The following report was published in the October issue of the Pork News and Views newsletter. Selected resources from the Workshop Manual are available at www.ontariopork.ca under “Production Standards-Animal Care Resources” or www.prairieswine.com. OMAFRA, with support from Ontario Pork and Prairie Swine Centre (PSC), held a very successful Group Sow Housing Workshop this past September in Stratford. The one-day workshop was presented on consecutive days and limited to 50 participants each day to allow for greater participation and discussion. It provided practical information on group sow management, sow feeding systems and helped answer questions about renovations and new design which followed the new Code of Practice for the Care and Handling of Pigs that was released in Canada this past spring. Three Ontario producers described their experiences transitioning to group sow housing systems followed by Dr. Jennifer Brown and Dr. Yolande Seddon, Prairie Swine Centre Group Sow Housing researchers, discussing the merits of each system. Dr. Kees de Lange, University of Guelph, explained how feeding systems need to change for a successful transition to feeding sows in group housing. The following is a brief report on the workshop. The new Code was released in March this year. Dr. Brown presented an overview of relevant areas. It includes changes to sow housing, pain management, space allowances, and environmental enrichment. For new construction there is a requirement that by July 1, 2014 mated gilts and sows must be housed in groups, with allowances around breeding and group management. As of July 1, 2024, gilts and sows must be housed in groups, or in individual pens, or in stalls if they are provided with the opportunity to turn around or exercise periodically, or otherwise have greater freedom of movement (suitable options will be clarified by July 1, 2019 based on scientific evidence). The Code is available at: www.nfacc.ca/codes-of-practice/pigs. Dr. Brown also presented a summary of a project that will develop and document demonstration sites across the country to provide resources and advice for producers, and to create a central database of information. Producers will be able to see examples and evaluate different group housing systems. The project is looking for producers interested in barn renovations for group housing in 2015-2016, and who would be interested in sharing herd information and renovation documentation. In exchange, producers will receive: expert advice on renovation planning, management; training assistance with funding applications; and compensation for research barn access. She compared aspects of the options and reported a Quebec industry analysis of the cost of conversion for different housing options, and the floor space requirements of the different feed systems. Acknowledging that early attempts with ESF systems encountered several challenges, she pointed out that technology, equipment design, and our own familiarity with computers has come a long way in 20 years. There is an increasing number of manufacturers, growing expertise, and a competitive market with new developments expected. The possible advantages of dynamic mixing she highlighted were: more flexible and efficient use of space; sows can be added over 10 weeks (but at least 10 sows each time); if a sow returns, she can enter in the next cycle; less overall space is required (fewer pens and alleys). Among the disadvantages is the potential for repeated aggression on mixing, but if mixing is well managed aggression can be kept low. Mr. John Van Engelen presented his experience in converting stalls to a group housing system using ESF. Dr. Seddon followed with an overview of pen configurations and management strategies to consider when implementing ESF. A common problem is that of ‘sow recycling’, when sows repeatedly enter the ESF system to try to get more feed. This reduces sow throughput, can cause some sows to miss a feeding, create stress and competition, and increase wear and tear on the equipment. Steps to reduce recycling include designing the layout so it is farther to walk to regain access (e.g. by using a dividing wall), using a shutter or retractable feed bowl, and ensuring feeders are not overstocked. Dr. Seddon illustrated a number of barn designs and rules of thumb when considering the layout of ‘bedroom’ lying areas, alleyways and areas of passing, conserving space (especially when converting from an existing barn footprint), and the importance of flooring to sow leg health. The importance of training was emphasized, and a number of tips provided. Both producers who spoke about ESF indicated that training had been a challenge and that starting with their gilts would have been a better approach. She concluded with some good general management and grouping strategies. Mr. Geert Geene provided information on his group housing system using a trough based drop feed system. Dr. Seddon followed with and outline of different competitive feedings systems, space considerations, and pen design and management strategies. Floor feeding vs. non gated stall systems, different flooring types, and building space requirements were compared. Although there is generally lower capital costs compared to ESF, there are challenges around controlling individual feeding and dominant sows. With careful management and observation these can be managed, but this probably requires more labour than an ESF system. She provided a comprehensive overview of factors to consider when making a decision, including barn design, feeder types, and space allowances. Dr. de Lange presented a thorough overview of “Nutrition for group sow housing”. He starting with the observations that, while the number of pigs born has increased, it is lightweight pigs that have increased, and that birth weight influences body weight at market time. This led to his outline of strategies to improve gestation feeding to improve sow lifetime productivity through an increase in piglet birth weight with increasing litter size, while controlling feed costs, improving sow welfare, and decreasing nutrient losses to the environment. Recommended interventions are ‘bump feeding’ of no more than 0.40 kg/d during late gestation, and the use of fiber sources to induce satiety and reduce abnormal behaviour. He outlined some nutritional aspects of different feeding systems for group housing and their varying requirements for space, capital investment, and operator skill. He suggests that ESF offers the most potential for the dynamic and precision feeding of individual sows. The workshop was well attended and generated a lot of questions and good discussion on the producer reports and the options and issues presented by the three researchers. The manual included handouts from the presenters and a number of relevant resources including excerpts from the Code of Practice and factsheets and information on sow housing and behaviour from the Prairie Swine Centre. Selected resources are available at www.ontariopork.ca under “Production Standards-Animal Care Resources” or www.prairieswine.com. 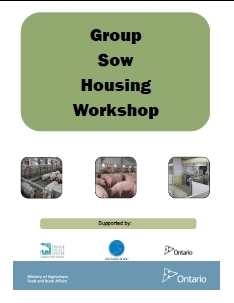 This one-day workshop being offered by the Ontario Ministry of Agriculture, Food & Rural Affairs with help from Ontario Pork and the Prairie Swine Centre will present group sow housing options that follow the new Code of Practice for the Care and Handling of Pigs. Three Ontario producers describing their experiences transitioning to group sow housing systems. Hear their challenges and opportunities and gain practical advice you can apply on your farm. Equipment suppliers will be present. What are the advantages and disadvantages of sow housing systems? Dr. Jennifer Brown and Dr. Yolande Seddon, Prairie Swine Centre Group Sow Housing Researchers, will discuss the merits of each system. Dr. Kees de Lange, University of Guelph, will explain how your feeding systems need to change for a successful transition to feeding sows in group housing. A release from the London Swine Conference yesterday www.londonswineconference.ca. London ON, March 4, 2014 – The theme is “Positioning for Success” as the pork industry prepares to gather in London for the fourteenth annual LSC. These two full days of presentations and workshops have moved to the Hilton London for Wednesday and Thursday, March 26 & 27, 2014. Speakers will cover topics ranging from practical on-farm decision making and management to the impacts of international trade on pork production. Wednesday’s Sow-focused agenda will include ‘Lessons Learned from PEDv’, along with experts in the areas of group sow housing, nutrition and lactation, and Ontario’s position in the global marketplace. At the farm level, workshops will consider piglet and milk management, reproductive troubleshooting, feeding the sow, and practical aspects of group sow housing. On Thursday, the focus is on Wean to Finish. Topics such as real factors that affect profitability, the importance of international trade to Ontario production, and national health status monitoring will be covered. Farm level workshops will include managing pile-ups, benchmarking and measuring profitability on-farm, spotting problems early, higher fiber diets, and improving feed efficiency. As always, the LSC program will include leading researchers, industry experts and pork producers. This unique mix of perspectives provides new insights and can lead to lively workshop discussions. Presenters this year will include: Steve Pollmann, Murphy Brown West; Doug MacDougald, South West Ontario Veterinary Services; Chris Byra, Canadian Swine Health Intelligence Network; Ron Bates, Michigan State University; Laurie Connor, University of Manitoba; Chantal Farmer, Agriculture and Agri-Food Canada; Ruurd Zijlstra, University of Alberta; Kevin Grier, George Morris Centre; Graeme McDermid, Cronin Pork Ltd.; Kathleen Sullivan, Trade Consultant. Conference fees are $135 per day which includes one copy of the proceedings, a reception on Wednesday, lunch and all coffee breaks. Discounts are available for groups of five or more who register and submit one payment. Registration deadline is March 14, 2014. Please note that there is no registration at the door. The London Swine Conference is a joint effort by staff from Ontario Ministry of Agriculture and Food and Ministry of Rural Affairs (OMAF and MRA), Ontario Pork, University of Guelph, Ontario Pork Industry Council, and is made possible through strong industry sponsorship. Canadian livestock producers are fortunate to have Codes of Practice to guide them in best practices for livestock housing, handling, and care. Revisions of these codes are being coordinated by the National Farm Animal Care Council, which is a collaborative partnership of very diverse stakeholders who work together on farm animal care and welfare. The Codes for several species are being updated. The last Pig Code of Practice was published in 1994, so an update is needed in order to reflect new practices, producer needs, and market expectations. The National Farm Animal Care Council has announced that a draft will be released on June 1st for a 60 day comment period. It is very important that Ontario pork producers review the content of the proposed Pig Code of Practice and provide feedback directly through the National Farm Animal Care Council website or through their producer association. This is the opportunity to comment on a document that will become the expected Canadian standard for pork production practices. The key areas of focus for this review have been sow housing, space, and pain management. This is your opportunity to provide input on this important document – don’t pass it up. The National Farm Animal Care Council website is http://www.nfacc.ca. The current direction in sow housing is moving away from the traditional gestation stalls and towards housing systems that allow the unlimited movement of individual animals. This change has led to unique management challenges when working with loose-penned animals. Read more in our new factsheet called Management of Sows in Loose Housing Systems.